Reckoned amid one of the credible market names, we are willingly betrothed in offering to our patrons High Tensile Nuts And Bolts. Developed and made up in line with the principles laid down by the industry, these are highly in demand. Together with this, these are inspected on a variety of standards before the final shipment. 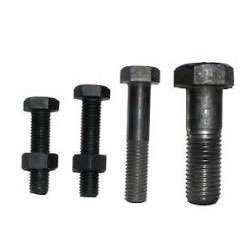 High Tensile Nuts & Bolts M10 TO M100 , LENGTH UPTO 5 METERS ASTM / ASME A/SA 193 / 194 GR. B 6, B 7/ B 7M, B 16, 2, 2HM, 2H, GR 6, B 7, B 7M. Incepted in the year 2015, Astec Inc. is a vital part of the Metal industry in India. Being Manufacturer, Exporter, Wholesaler, Retailer and Importer, we provide a wide range of Stainless Steel Plates, Stainless Steel Sheets, Stainless Steel Coils, Stainless Steel Pipes and much more to a demanding National & International market. Astec Inc. is a sizeable and well-established company having the experience of over more than 20 years in the industry. We have been serving our clients in a wide range of industries, which include Ship Building, Petrochemical, Refineries, Pharmaceutical, Precision Engineering, Paper, Fertilizer, Chemical, Power Plants, and Oil & Gas etc. We value for a single piece of a requirement to large turnkey project & give “MAXIMUM” service to all. We offer the industries widest selection of stainless steel including Austenitic, Duplex, Martensitic, Ferritic stainless steel. We have approved Wholesalers to various government department & Public sectors all over the country & regularly supplying to them for a long time. We have got ready stock of the above items in various sizes as per National / International Standards & Specification & the same shall be supplied as per your requirements at very reasonable rates. We also offer Third Party Inspection for our complete batch of products by international certification agencies like Lloyds Register, Bureau Veritas, DNS etc.